In order to fully implement the point-of-care nature of our diagnostic, we developed a small battery-powered device that can be easily taken into the field. The device is capable of measuring the fluorescence produced by our bacterial diagnostic system. The addition of a GPS sensor tags the location of the measurement for epidemiological analysis. By using 3D printing as well as the open source Arduino system, we were capable of producing an affordable product. The final device was made with the help of several experts. We implemented their opinions and advice into our prototypes. Moreover, we created an example of what the packaging could look like. The box is easily transported and includes the Mantis device as well as all the detection vials, including the controls. An easy step-by-step user guide explains how the device is operated. Starting from our initial concepts that we wanted to create an affordable, robust tool for use in the field, we produced prototypes using 3D printing. The printer we used is an Ultimaker 2+ provided to us by Ultimaker. As we wanted a device that could show a fluorescent signal, we initially focused on incorporating this feature within our first designs. The fluorescent proteins produced by our system are excited by UV-LED’s with a specific wavelength. The emission spectrum is visible by the naked eye, allowing one to directly observe a positive test result. The membrane-sealed sample vials containing our bacterial system are placed in the device from the top. Initially we started off with a device which fits one sample. However, we soon realised that adding a positive and negative control makes the device more reliable. The positive control would detect proteins present in all human blood, such as albumin or immunoglobulins, while the negative control would lack the detection system. Once the button is pressed, the UV-LED’s are turned on and the signal can be compared to the positive and negative control in order to determine the result. This approach was problematic since lighting conditions, background signal and observers are not a fixed variable. This prompted us to rethink the way the device works. Moreover, we showed this initial design to dr. Philippe Büscher, head of the Unit of Parasite Diagnostics (Institute of Tropical Medicine, Antwerp). He liked the ease of use and the presence of a positive control. He endorsed our idea of quantifying the fluorescent signal and adding an LCD-screen for a more objective readout. In addition, dr. Büscher suggested us to make the labels for the sample, positive and negative results better readable. We implemented this into the next prototype. Figure 1: Overview of the first iterations of the device. The first working prototype of Mantis included space for three membrane-sealed sample vials: a positive control, a negative control, and the sample. In order to take out the variables of the external lighting conditions, background signal and observers we wanted to use cheap and simple electronics to quantify the signal. This led to the removal of the ‘windows’ in the front of the device and a slightly bigger design to accommodate the electronics. The improved computational approach to read the signal was based on Light Dependent Resistors (LDR). This component changes its resistance according to the amount of light that it receives. This resistance can be measured via a simple circuit (see Figure 2) and processed by the Arduino microprocessor. Once the button on the front of the device has been pressed, the sample vials are excited with UV light and the emission is detected by the LDRs. The signal of the sample is compared to the positive and negative control and the final result is displayed on an integrated OLED display on the front. Although this is a major improvement over trying to detect the signal by eye, this way of detecting the light is unreliable due to the characteristics of the components used. Figure 2: Overview of first working prototype as well as the electric circuit used. To improve the measuring capabilities of the system, various components were exchanged. First, we chose to calibrate our device using fluorescein, as this circumvents the use of recombinant bacteria in this part of the prototyping phase. The UV-LEDs were exchanged for 475 nm blue Cree LED’s, which will excite fluorescein provided in the InterLab study kit. This wavelength is much safer to use, as it is not harmful to the retina. Figure 3: A) Improved circuit diagram used to amplify the signal from the photodiode. B) Amplifier circuits built according to the diagram. C1/C2) Overview of the test setup used to gather data. Second, circuits containing LDR’s were replaced. Whilst cheap, LDR’s are not very suitable for taking precise measurements. To improve on this we chose to implement photodiodes, a semiconductor which converts light into electrical current. This signal needs amplification, for which a small transimpedance amplifier (TIA) circuit containing an operational amplifier was used (Figure 3A/B). Furthermore, a small piece of orange filter paper was placed in between the photodiode and the sample. The filter paper blocks much of the blue light coming from the LEDs, thereby reducing the amount of background signal. These parts were combined in a prototype setup as seen in Figure 3C. Measurements were taken using a fluorescein dilution series, the results of which are shown in Figure 4. Figure 4: Results of fluorescein measurements using two different TIA circuits with photodiodes. The resulting graphs show a calibration curve in the range of 0 to 2 mM of fluorescein (Figure 4A). In order to check reproducibility, the whole setup was built again and the results are shown in Figure 4B. These results show the same linear calibration curve and thus prove that this system is reliable and reproducible. 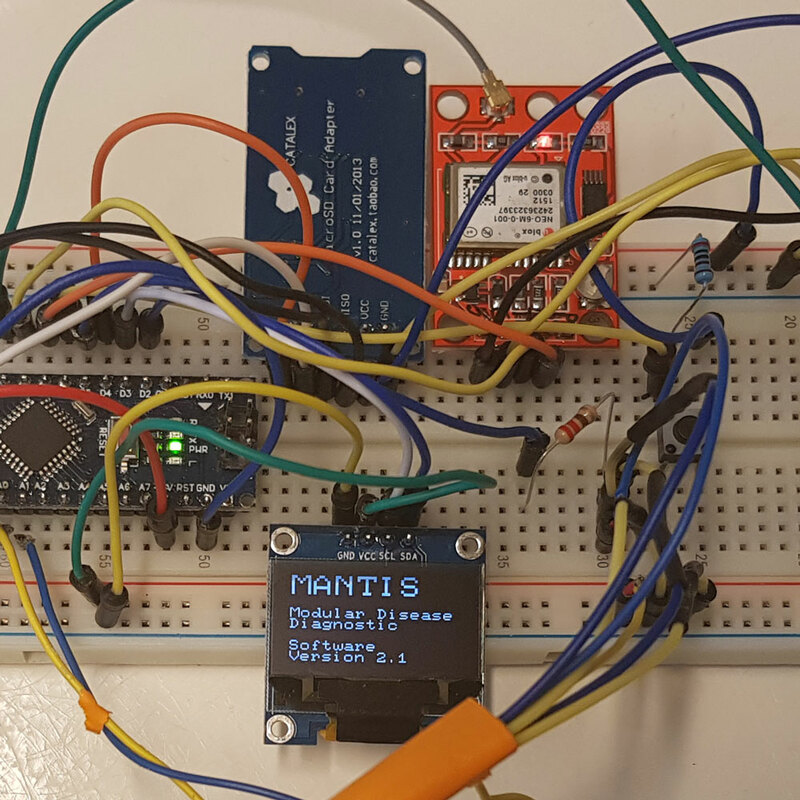 Figure 5: Prototyping phase, with added GPS sensor and SD card reader. The students of the Quantified-Self course, as well as dr. ir. Arnold van Vliet advised us to add a GPS sensor to the device (Figure 5). 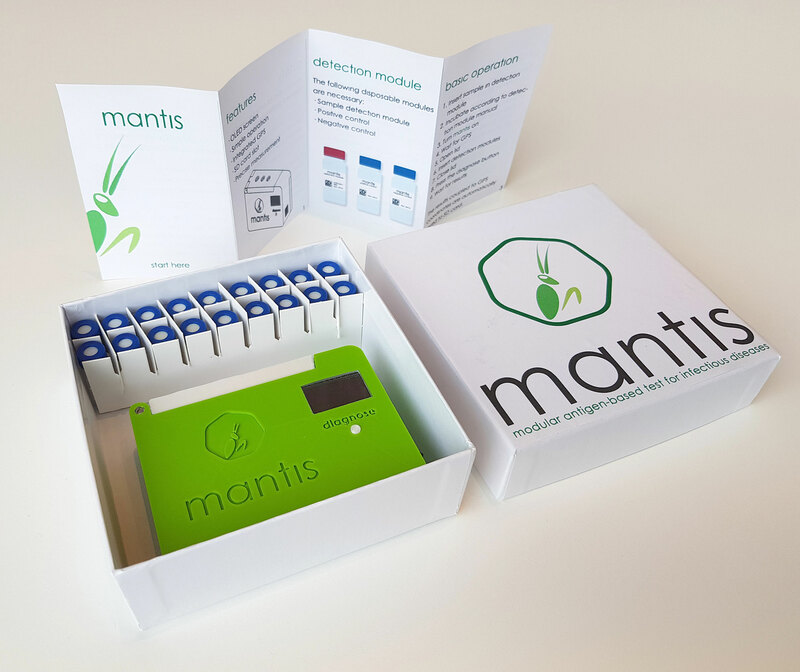 The possibility of saving the diagnosing data together with the GPS data allows the Mantis diagnostic system to aid in mapping and monitoring outbreaks of a certain disease. The data can easily be transferred from the micro SD card to a smartphone or computer and uploaded to any cloud service. 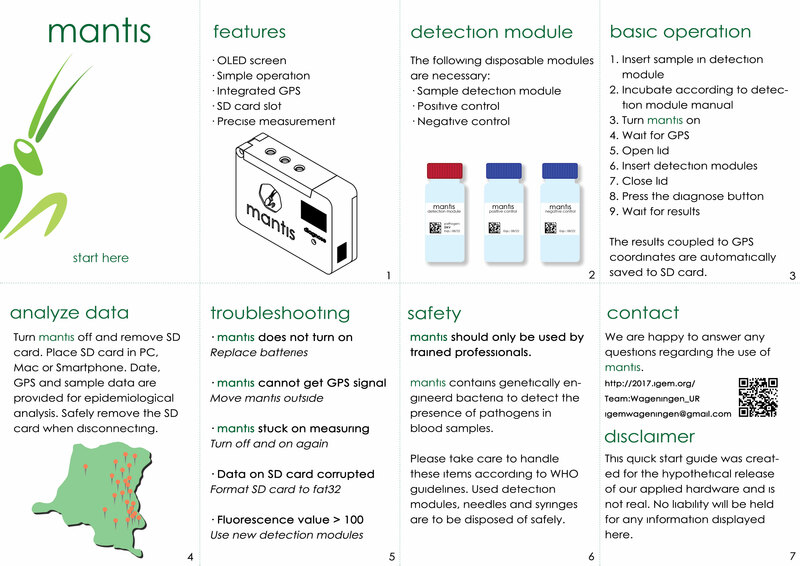 All the data gathered by the Mantis devices in the field will help to create a global picture of all disease outbreaks. This is essential in monitoring outbreaks and preventative measures can be taken to stop epidemics from emerging. One of our final prototypes was evaluated by dr. Erwan Piriou, Laboratory advisor at MSF. He confirmed the ease of use and believes that “people would definitely be able to use this device in the field”. 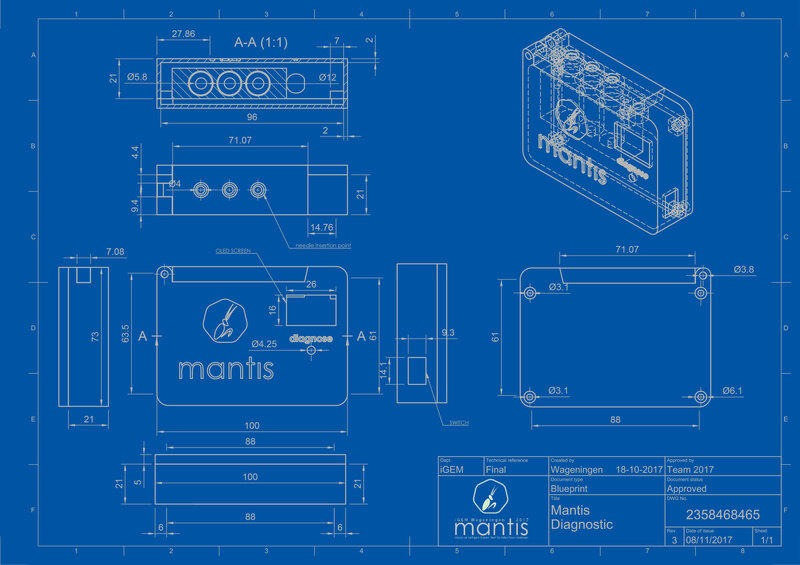 Figure 6: Blueprint of the Mantis diagnostic device. Biosafety is a big concern when working with possibly contaminated samples. Therefore we conducted a long running experiment (3 months) to see whether certain disinfectants alter the structural properties of the material used for the device. After 3 months, there is no noticeable change in the structural characteristics of the PLA used for the Mantis device. The device can be easily disinfected with ethanol or halamide without damaging it in the process. Besides desinfecting the device, we also chose a biocontainment mechanism to avoid the bacteria from surviving in the nature in case of accidental spill. Furthermore, the segment of the device which holds the vials is printed with Innofil Pro PLA filament which can, after a curing cycle, withstand temperatures up to 150°C. This means that this segment can be cleaned with disinfectants but can also be sterilized by autoclavation, if necessary. Figure 7: A) Structural integrity test with different disinfectants. B) Vials used in Mantis device: negative control, positive control and detection module. C) Vial segment used in the mantis device, made out of Innofill Pro PLA. The table on the right shows an overview of the costs to produce one single prototype of Mantis. The individual components were not bought in bulk, but at local retail stores in The Netherlands. €54/US$62 is an extremely reasonable amount for this type of reusable diagnostic test. According to WHO, ASSURED characteristics, the costs of a detection machine should be less than US$500 , which means that the €54/US$62 is well within this range. 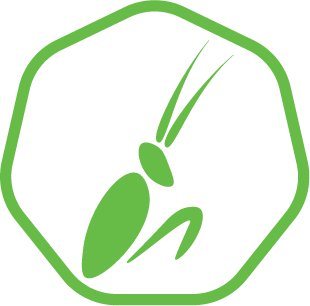 And although an initial cost of the Mantis prototype is relatively cheap, production cost will decrease tremendously when this product would be mass produced. Moreover, the WHO states that the cost of the individual test should be less than US$10 . In our current setup, we are using septum-sealed Agilent HPLC vials to contain our bacterial system, of which we need three (positive control, negative control and sample) to test a single individual. At a cost of approximately €0.72/ US$0.83 , we are within this range as well. As a future improvement, we would like to switch to a microfluidic cassette, as this could circumvent the three injections points, and combine them into one. Furthermore, mass production of plastic injection molded microfluid casettes will result in cheaper individual tests as compared to the use of glass HPLC vials. Wu, Grace, and Muhammad H. Zaman. "Low-cost tools for diagnosing and monitoring HIV infection in low-resource settings." Bulletin of the World Health Organization 90.12 (2012): 914-920. Agilent | 2 ml Screw Top Vials & Caps, www.agilent.com/en-us/products/lab-supplies/chromatography-spectroscopy/vials-closures/2-ml-screw-top-vials-caps#buy-products.